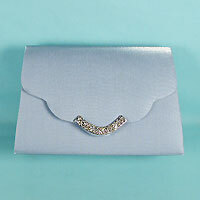 Faux metallic leather clutch with large crystal rhinestones down the front. Includes matching shoulder cord with a 21 inch drop. Color: royal. Hue: electric. color code: #003E9C. 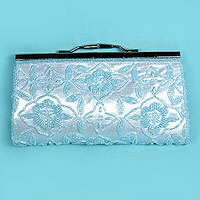 Measurements: width 10", height 3½", depth 1-3/4"
Long sleek satin purse with metal frame and feet. Includes metal shoulder chain. 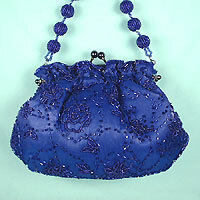 Beautiful satin bag with all over beaded design with beaded ball handle. 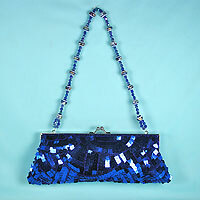 Measurements: width 8½", height 5½", depth 2½"
Sequined and beaded clutch bag with square sequins. 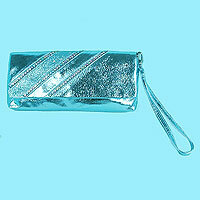 This sparkly evening bag is long and sleek. It has a trapezoid shape with the bottom wider than the top. 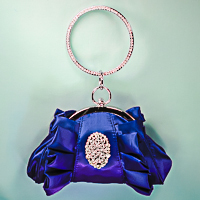 The frame is metal and it has a beaded retractable handle with an eight-inch drop and a shoulder chain with a 22-inch drop. It is fully lined with a pocket on the side. 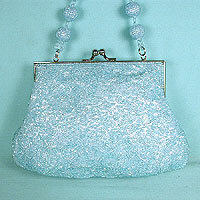 It has great style and lots of sparkle. 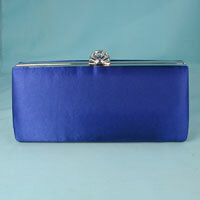 You will love the roomy interior of this evenng clutch bag which can hold your cell phone and several other items. 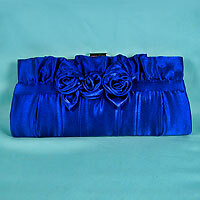 Measurements: width 10", height 4", depth 1½"
Satin clutch purse with pleated front and rose trim. Includes shoulder chain. 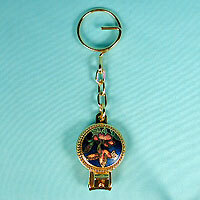 Measurements: width 10½", height 4½", depth 1½"
This keychain nail clipper is a pretty accessory to carry in you purse or evening bag. Color: royal. Hue: royal. color code: #0000FF. Type: humming. 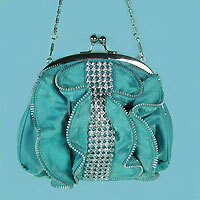 Measurements: width 1-1/8", height 1-3/4", depth 1/2"
Beaded evening bag with rhinestone trim and beaded fringe. 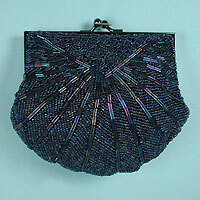 The color is iris blue with beads that vary in colors of dark blue, purple, bronze and turquoise. 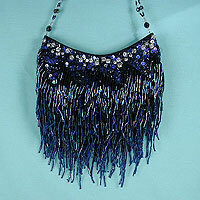 The top is done in bugle beads and sequins and enhanced with clear rhinestones. 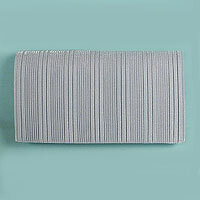 The fringe is made of bugle beads attached in diagonal rows. 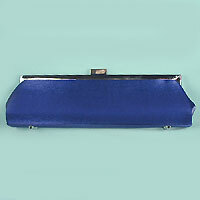 The body of the purse is made from midnight blue fabric. 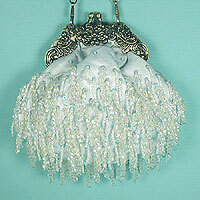 The handle has a double row of glass beads in clear and iris colors. 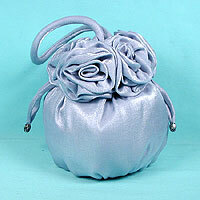 It is lined in satin with a small pocket on the side and a snap closure. Color: iris. Hue: iris multi. color code: #2C00CE. Measurements: width 7", height 4.5", depth 1"
Color: iris. Hue: iris multi. color code: #2C00CE. Type: silver.